A quick and easy tiffin recipe made with paneer and instant sevai. 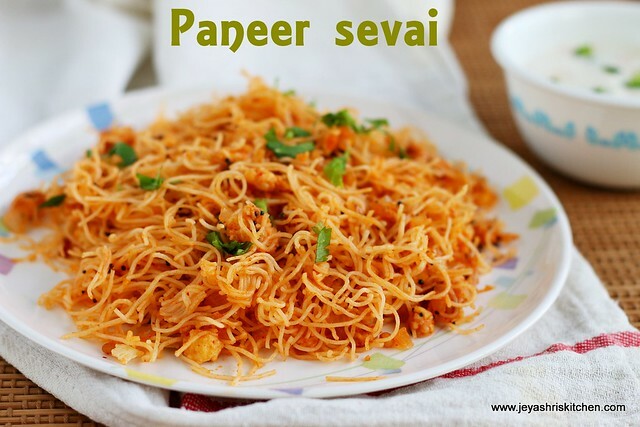 If you are looking for an easy yet delicious tiffin, then this paneer sevai is a must try one. We are back from our London, Europe holiday and after that i visited India, for my niece wedding. Still using the drafted posts which i have scheduled for the vacation. Yet to take the camera in hands and click a new recipe. Stay tuned for more interesting recipes coming up. 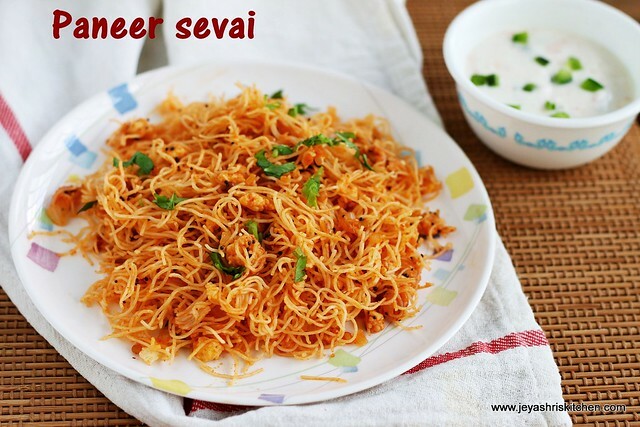 Check out my masala idiyappam recipe and curry leaves sevai recipe. 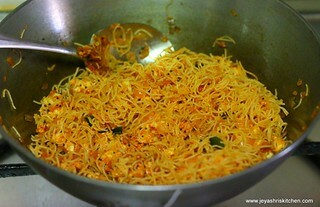 Cook the sevai |rice noodles as per the instructions. I used concord brand, i just put that in hot water for 3 minutes and drained the sevai. In a pan add oil and add the mustard seeds and urad dal to this. Add curry leaves and ginger garlic paste to this. Cook till the raw smell goes off. Finely chop the onion and grind the tomato . You can use tomato puree too. Add the onion and cook till the onions turn pink. Add the tomato puree to this. Add red chili powder, fennel powder and salt to this. Cook in a low flame till the raw smell goes. Mix well and cook for 2 minutes. Add the cooked sevai to this. Mix gently and let it cook in a low flame for 2 minutes. Switch off the flame and garnish with coriander leaves. Serve hot with any raita of your choice. Instead of using store bought ready made sevai, you can use home made idiyappam too. Finely chopped carrot, frozen green peas can also be added to this. If you do not have fennel powder add 1/4 tsp of fennel seeds(sombu) while adding the mustard seeds. Made this yesterday Jeyashri. Simply the best discovery of this year so far :-) It was the marana mass! !